TRUSSVILLE — A Hewitt-Trussville High School senior whose mother passed away from breast cancer last September at age 47 has been instrumental in making this year’s annual Turn Trussville Pink fundraiser a splash. Bailey Hemphill arranges T-shirts being sold at Tula J Boutique Trussville where she works. Hemphill, a senior at Hewitt-Trussville High School, designed the shirt’s art in honor of her mother, Deana, who passed away last year from breast cancer. Bailey Hemphill designed the logo for the pink T-shirts being sold at Tula J Boutique and Complete Cleaners in Trussville to raise money for the Audie and Kathy White Cancer Research Foundation, a 501(C)3 nonprofit group started by Joshua White as an extension of the Turn Trussville Pink fundraiser that the 26-year-old launched in 2006 while in high school at HTHS. Like Hemphill, Joshua was inspired by his mother, Kathy, a breast cancer survivor who is again facing another bout with the disease that one in eight U.S. women will endure at some time during their lives. Joshua said he was also influenced to begin the fundraiser formerly called Turn Hewitt Pink, by two of his teachers who suffered from breast cancer. Hemphill said she too has had teachers who have faced the deadly disease. After Joshua’s father, Audie, died from brain cancer in 2009, Joshua founded the non-profit organization frequently referred to as the AKW Cancer Research Foundation. All of the funds raised by the foundation benefit the UAB Cancer Research Foundation. “We started that in 2010 in memory of my father and in honor of my mother,” Joshua said. Deana’s cancer went into remission following treatment with chemotherapy, but was later reactivated, according to Bailey. 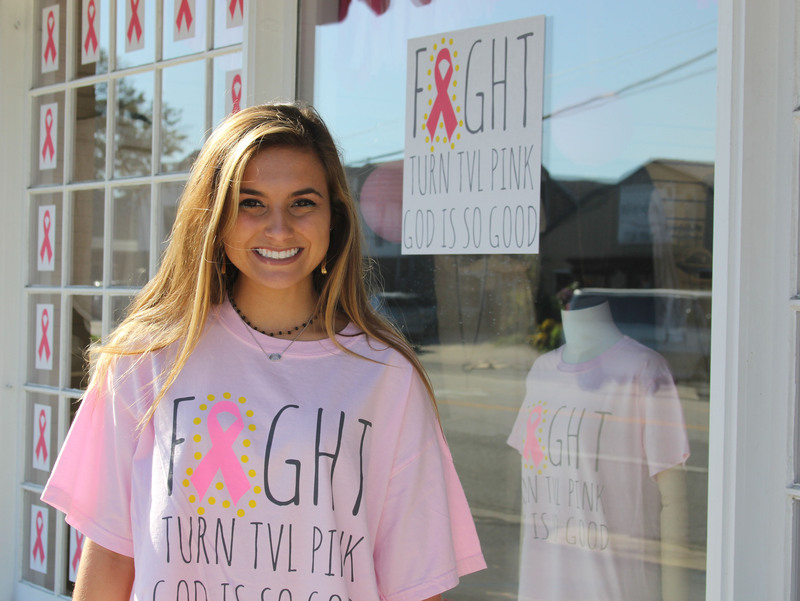 Bailey Hemphill wears the Turn Trussville Pink T-shirt she designed in front of a window display at Tula J Boutique decorated in a breast cancer awareness motif. The Main Street clothing store is selling the shirts to benefit cancer research at UAB. Bailey said designing the graphic used on the T-shirts being sold this week was an emotional reminder of her mom. However, she added that it pleased her to be able to take part in an event that increases awareness of breast cancer and raises money for additional research that may one day result in new ways to fight the disease, or even lead to a cure. Bailey said her design was inspired by a wood sign that her late father, Neil, made for his wife. It included the word “Fight” with the “i” replaced with a breast cancer awareness ribbon. It also included the phrase “God is so good,” a slogan in the Hemphill household. “That was her motto,” the 17-year-old high school senior said about her mother. Because Bailey works at Tula J Boutique as part of her school’s cooperative education program, she has an opportunity to sell the shirts she designed and meet those who are buying them to support the cause. The Main Street store’s window display is currently designed to remind those who pass by about breast cancer and inspire them to support efforts to fight it and to get regular screenings for the disease. “It’s all about raising awareness,” said boutique owner Ashli Posey. Other local shops are selling pink ribbons for $1 apiece to benefit the AKW Cancer Research Foundation. Businesses selling the ribbons include Bryant Bank, Barnett Furniture, Shirley’s Florist and Birmingham Orthodontics. On Wednesday, all of those who support the cause are encouraged to wear their T-shirts, ribbons and other pink items to increase breast cancer awareness as part of Turn Trussville Pink. White said donations to the 501(c)(3) organizations can also be made online via paypal . Donations also can be made on the organization’s Facebook page. Since Joshua’s foundation was first formed, it has raised more than $150,000 to benefit cancer research. The goal is to sell as many of the 1,000 pink T-shirts created as possible. They are available in long- and short-sleeve and in sizes suitable for children and adults. The cost of the shirts range from $18-24. Joshua said other local businesses will be decorating their facilities to commemorate Turn Trussville Pink.”Some people will be painting their windows; doing things like that,” he said. Also on Wednesday, Chick-fi-A of Trussville will be selling cookies to raise money for White’s foundation and the Marco’s Pizza on Main Street will donate a portion of their sales that day to the cause. Joshua said in addition to raising money for his non-profit organization, Turn Trussville pink serves to remind the public of how prevalent breast cancer is among women. He added that — while rare — men also are susceptible to the disease. On Oct.26, Sherry’s Café is hosting a “night out” for ladies in the community currently undergoing treatment for breast cancer. Joshua said his organization is asking members of the community to nominate friends, co-workers or family members for inclusion in this special night by sending emails to turntrussvillepink@gmail.com or by sending messages to the organization’s Facebook page. “We are so excited to honor these courageous ladies with food and fellowship,” said Joshua, 26, who works as a financial analyst at Regions Bank. Posey said she believes the event will benefit the survivors being honored — in part — by reminding them they are not alone in their battles.